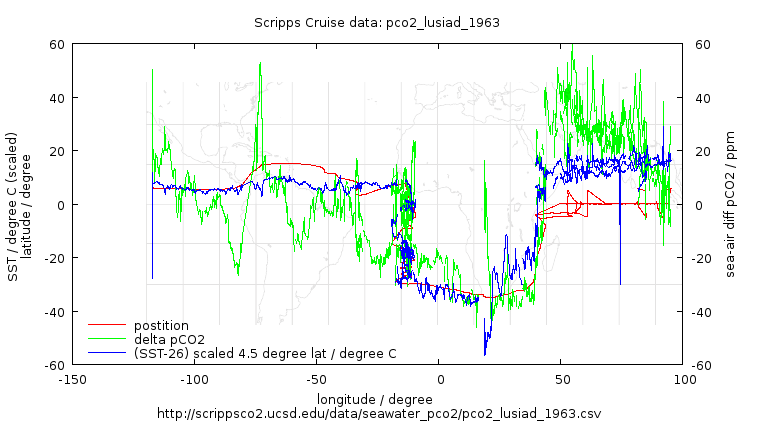 Graph showing data from the most recent (1963) cruise. CO2 and SST plotted against geographic position. There are several regions showing different profiles. In particular the Indian Oceans stands out as behaving very differently. What is interesting is the approximately linear relationship between temperature and latitude over much of this range with a scaling of 4.5 deg lat / deg C with a ‘neutral’ SST of 26 degrees. This is centred on 5.5 deg north, the inter-tropical convergence zone. the drop off across the region being it adapting to surface conditions by out-gassing CO2. The NOAA map shows the very warm waters of the Indian Ocean remain warm around S.A. and are cooling as they pass into the tropics. This would be consistent with the CO2 deficit in that region. There was also a strong deficit in the region stretching out from the Gulf of Panama into equatorial Pacific.